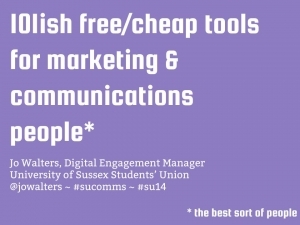 I’m speaking at Students’ Unions 2014, a conference for students’ union staff and officers. This year it is in glamorous Bolton and I’ll be talking about content marketing and communications tools. My presentations are linked below but I plan to blog about the themes raised and tools suggested in more detail. To be notified when I update my blog with more details you can subscribe to my sporadic email updates. Since going to the Content Marketing Show, run by my friend Kelvin Newman (who was recently voted as having had the most impact on the digital marketing industry over the past year!) 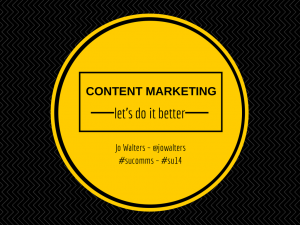 a few years ago I’ve been learning more and more about content marketing. It’s one of those things that is actually fairly obvious – people don’t like being ‘sold’ at so aim to be useful and friendly so they’ll come to you when they need you. My freshers newsletter campaign is an example of content marketing, offering people something useful – in this case information about our events and learning about being a student – in return for permission to communicate with them so you can build a relationship with them. The point of my presentation is that it is often easier not to bother and just to spam people with messages focused around yourself. Instead, I think we should be focusing on what students want and how we can help with that. I should point out that this presentation looks beautiful because I made it with Canva, my new favourite tool which makes it super easy to design amazing looking things. I initially pitched this session by plucking the number 101 from the air as it sounded more interesting than 74 and more impressive than 14 not expecting the session to be chosen. Turns out it was and that 101 is a lot of tools to find and list! My original session time was halved to 30 minutes which gave me a good excuse to aim for 50 tools instead as well as an opportunity to crowdsource an extra 50 to hit my original target. If you have any other tools I should add to my list please let me know – jo@joannawalters.co.uk – @jowalters – or leave a comment below.